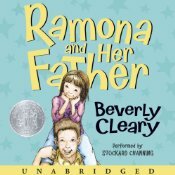 Ramona and her Father by Beverly Cleary, read by Stockard Channing. Grades K-3. Listening Library, 2004. 2 hours, 8 minutes. Review copy provided by my local library. Ramona Quimby, spunky second-grader extraordinaire, is looking forward to the upcoming Christmas holiday when the Quimby family receives terrible news: Ramona's father has lost his job. Ramona wishes she could do something to help. Maybe someone would pay her a million dollars to be in a commercial! Or maybe she can at least get her father to stop smoking. As the Quimbys pinch their pennies, it's up to Ramona to keep their spirits up! I loved all the Ramona books when I was a kid, but I think Ramona and her Father was my favorite. And even though it's not about Christmas, I always think of it this time of year because it starts with Ramona making her Christmas list and it ends with the Nativity scene at their church. The Ramona books are beloved by thousands and one of the nice things about them is that they don't seem dated. Ramona and her Father will be particularly accessible to kids today because with the economy the way it is, a parent out of work is something that many kids can relate to (unfortunately!). Stockard Channing does a nice job of narrating these audiobooks. She has a very nice speaking voice. My one complaint is that I do not care for her Ramona voice. She makes Ramona sound like a silly little kid and, while, okay, Ramona is kind of a silly kid, she's more than that to young readers. When I read these books as a child, I identified with Ramona. I took her more seriously (and she takes herself more seriously) than Channing's voice gives her credit for. That said, these are nice recordings and the Ramona books are a great choice for family listening. They're short enough that you can use them for short trips around town or pick up several for a longer car ride. Hey, I'm an Audible affiliate, which means that if you purchase items after clicking on links from this page, I may get a small commission.